Replica Guns Swords :: Replica Swords, Cutlasses, Daggers and Knives :: Medieval Swords Replicas :: Richard the Lion Heart's Sword. 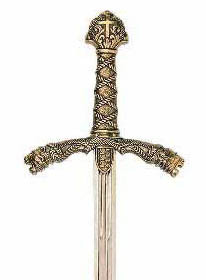 Richard the Lion Heart's Sword. Richard the Lion Heart's Sword With Scabbard: This Sword bears Richards initials and famous crest with the lions. The massive handle is cast in metal (zinc) and finished with a Gold tone. A cross is embossed on the pommel and rope crisscrosses the handle to ensure a firm grip. Length: 41.25", Weight: 5.2 lbs.